Call it what you will — galette, rustic tart, or free-form pie — but this is one of my favorite desserts to make. I make apple galettes in the fall and winter, rhubarb tarts in the spring, and a variety of stone-fruit tarts throughout the summer. The basic recipe is the same: pastry dough plus "cookie dust" (a dry filling that keeps the fruit from soaking through the crust) plus fruit. 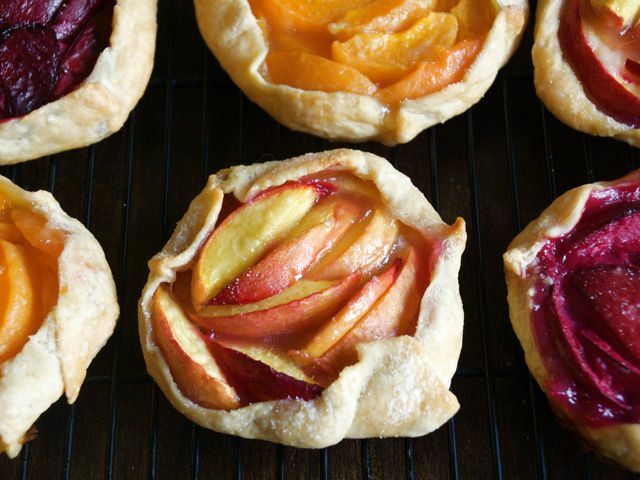 You can make one large tart, combining various stone fruits, or individual tarts. Also, you can make these as tart or sweet as you like; I personally like my tarts on the sour side, served warm with a scoop of sweet vanilla ice cream. Prep the pastry dough: Roll out the galette dough into a 14-inch circle, then place it on a baking sheet lined with parchment paper or a silicone baking mat. If you're making smaller, individual tarts, divide the dough into 6 pieces, roll the pieces into circles about 5 to 6 inches in diameter, and place them on the lined baking sheet. Place the pastry in the fridge until you're ready to assemble the tarts. Prep the filling: Toss the sliced fruit with the sugar and flour in a medium-large bowl. If making individual fruit tarts, divide the flour and sugar into as many bowls as you need to to distribute the different types of fruit. Assemble the galette(s): Remove the tart dough from the fridge and sprinkle ¼ cup of the cookie dust onto the dough, leaving a 1½-inch border free. If making smaller tarts, sprinkle a heaping tablespoon of cookie dust over each pastry circle, leaving a 1-inch border. Place the fruit mixture over the cookie dust, spreading the fruit out, leaving the border free around the entire galette. With clean hands, fold the border of tart dough over the fruit, crimping the folds as you go. Make sure the folds of the dough are sealed; any weak points (thin dough, not enough dough around the edge) could allow fruit juices to escape (and burn) while cooking. With a pastry brush, brush the cream (if using) over the pastry edges, then sprinkle over about a teaspoon of sugar. Bake the galette(s): Place the tart(s) in the center of the preheated oven and bake (45 to 55 minutes for a single tart, 30 to 40 minutes for small tarts), rotating the pan halfway through cooking. The tart(s) is/are done when the juices are bubbly and the crust is golden. Cool on a rack for 15 minutes before serving. Serve tarts with vanilla ice cream, if you like.